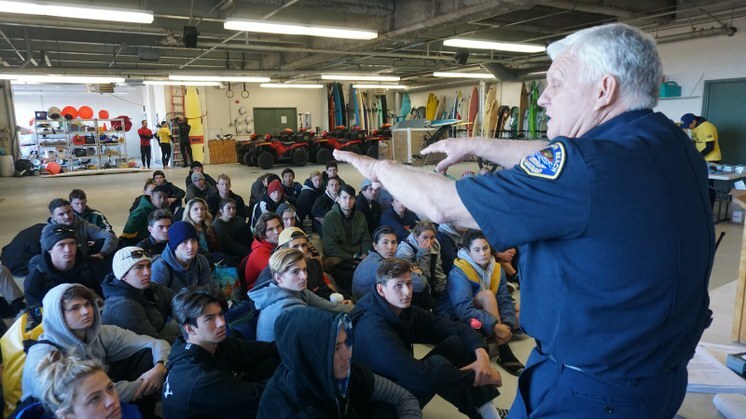 On a bracingly cold morning in Huntington Beach, a big group of teenagers and 20-somethings gathered outside of the city’s main lifeguard station. 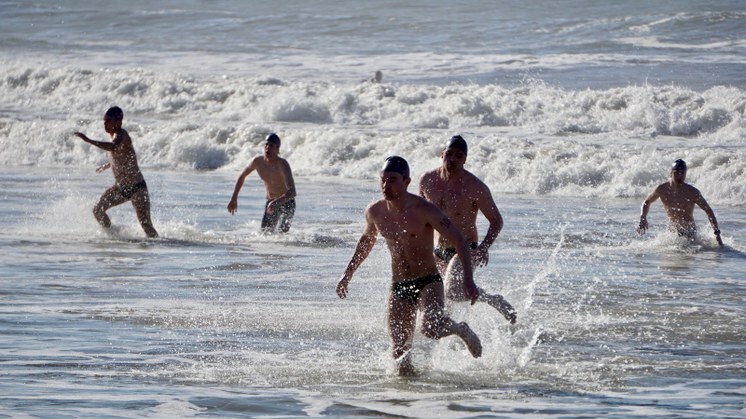 They were here to participate in the city’s annual lifeguard tryouts, one of many held up and down the California coast this time of year in preparation for the summer beach season. New lifeguards hired by Huntington Beach must be at least 17 years old when they begin the job. They’ll earn a starting salary of $18.65 an hour, with a five percent increase if they pass a bilingual exam. The lifeguard candidates were led into the station’s hanger-like workspace and asked to sit on the floor for a short briefing. Huntington Beach lifeguard coordinator Michael Eich began by reviewing the morning’s weather conditions: Winds were strong and the surf rough, with water temperatures hovering around 50 degrees. The conditions were terrible if you were seeking a warm and relaxing day at the beach, but great if you wanted to see if candidates had what it takes to be lifeguards. After reviewing conditions, Eich told the candidates they’d be swimming in three open water exercises that day, all closely monitored by professional lifeguards on the beach and in the water. After the briefing, each was issued a purple swim cap and had a number written on both of their shoulders for identification in and out of the water. The scene had the feel of a military boot camp. Huntington Beach Marine Safety Officer Claude Panis said that was on purpose because of the stakes involved in lifeguarding and the reputation of Huntington Beach in the lifeguarding world. The Orange County community, also known as Surf City, established its lifeguard service in 1918. Huntington Beach was also one of the first cities to adapt programs first used by the military to monitor the beach and save lives. “We’re a paramilitary organization, so there is a a lot of military influence here,” said Pannis. Lifeguard candidate Kevin Asis said that sense of seriousness and purpose made him want the job. Asis, who’s also a water polo player, said he’d been training for weeks to prepare for this morning’s tryouts and hoped all the work would pay off. The wind kicked up as the candidates walked across the wide cold beach to where they’d start their first test of the day, a thousand-yard swim around Huntington Beach’s massive pier. 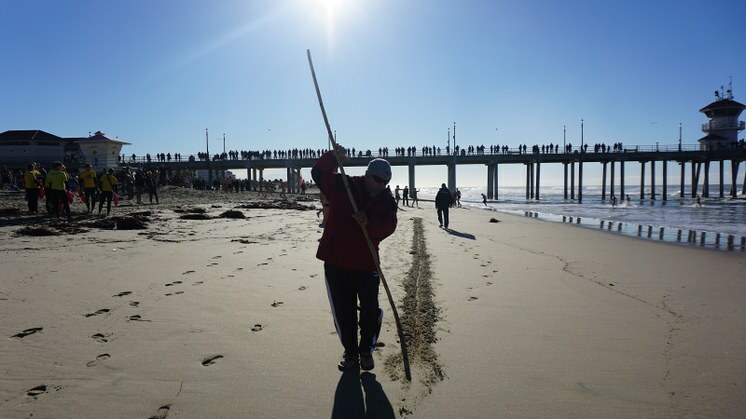 Using a stick, Sean Richardson, who’s volunteered at lifeguard tryouts since he was a child, drew a long furrow in the sand that would be used as the starting line for the first swim. Richardson said the swimmers who maintain strong and consistent strokes, while being aware of waves and currents would do well in the tryouts. “It’s people who aren’t paying attention to the water environment that falter,” said Richardson. Richardson said it’s common for even strong athletes who spend most of their time in a swimming pool to fare poorly in the open-water environment because the of ocean chop, waves and currents. After the candidates gathered in a long row on the beach, the swim began with the bang of a starter’s pistol. The pack of people sprinted to the water, dove in and quickly became indistinguishable as they swam through the high surf. It soon became clear just how rough conditions were as some candidates turned back to the beach and called it quits, disqualifying them from further participation. About fifteen-minutes later, those who finished the entire course began to emerge from the water,first one or two at a time and then in bigger groups. Many were cheered on by family and friends who had come to show support. As they crossed the finish line, their timings were recorded by lifeguards. As she worked to catch her breath, Breena Thomas reflected on the swim. Thomas was confident that she would do well in the two remaining swims, the last of which also involved a ??? yard run on the beach before crossing the finish line. Many of the lifeguard candidates had the advantage of living in wealthier coastal communities and had grown up swimming and surfing in the ocean. But not Luis Pacheco, who was raised and lives in Compton. He was also one of the few people of color trying out for a lifeguard position. Pacheco also said how much he appreciated the support of his parents and his girlfriend who came to cheer him on. Out of the 81 people who tried out, 40 passed the physical tests and were invited back for interviews the next day. Out of those candidates, Huntington Beach says it will offer two dozen applicants lifeguard jobs. After weeks of training in rescue techniques and first aid, they’ll report for duty in June, just in time for the summer beach season. Those who are picked to be lifeguards will often return to the job summer after summer. Many will also go on to careers in public safety and park and recreation work. “When people work together to save lives, they become close and build relationships that last for the rest of their lives, says Huntington Beach Marine Safety Officer Claude Panis. Photo credit: Saul Gonzalez.